By popular demand, we’re finally paying homage to the birthplace of some of our favorite bands, genres, and record labels: Manchester. They gave us Joy Division, James, the Smiths, the Fall, the Stone Roses, and apparently the Bee Gees? They gave us the Hacienda, the Twisted Wheel, madchester, baggy, the list could go on and on. 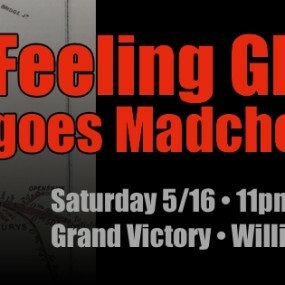 So come out to Grand Victory on 5/16, where we will fill the air with Mancunian songs aplenty. We’ll have a contest to see who can name the most bands from Manchester (it could last a long time) and be sure to wear some Manchester gear to get in half off. As always we’ll dance to our favorite bands and forget our cares and our L train woes.